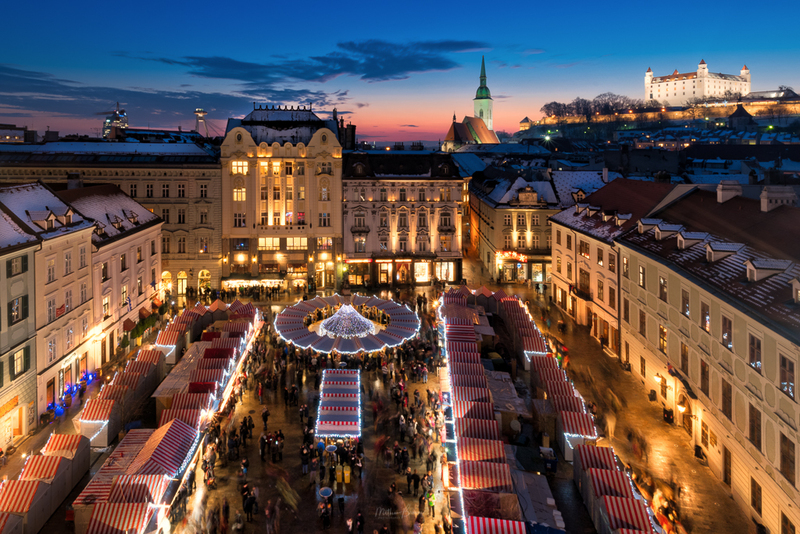 I recently visited Bratislava along with my wife and five month old son, to visit the Christmas markets and to explore the city’s photo opportunities. Here are my top five photo spots in Bratislava, with my tips on how to capture the best photographs. I also include details of the exact equipment and settings that I used for my work. The best view is from the tower of the Old Town Hall. Visit here in the afternoon to enjoy the museum at the Old Town Hall first, then ascend the tower before sunset and enjoy the changing light in the sky as the buildings light up beneath you. In winter, the Christmas market here is beautifully lit. There is very limited space at the top of the tower, so avoid taking a large tripod. There is a wall at chest level, so you can balance your camera here or set up a pocket tripod. Be very careful though and always have a hold of your equipment – it’s a long way down! Near the main square, you can find Čumil, one of Bratislava’s most photographed statues. 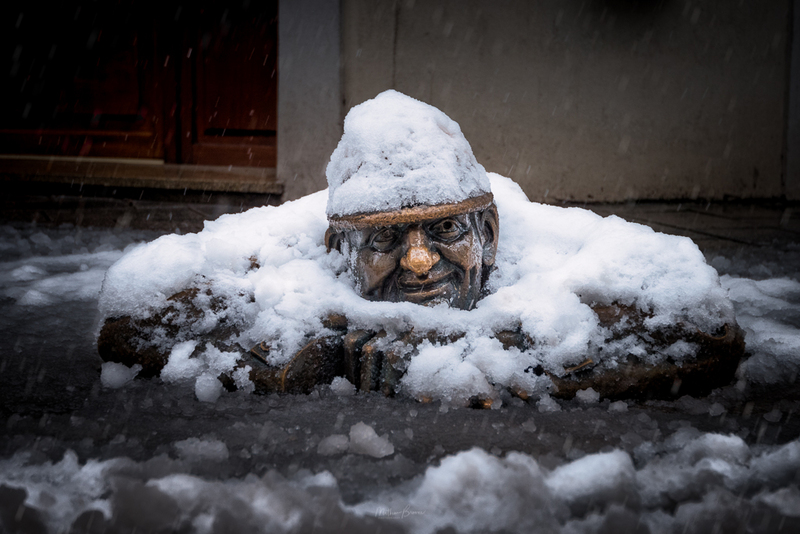 He peeps out of a manhole at the junction of Laurinská and Panská streets. Crouch low or set your tripod at its shortest setting to capture him. A low f-stop creates a shallow depth of field and an attractive background blur, which keeps the viewer’s focus on the statue. 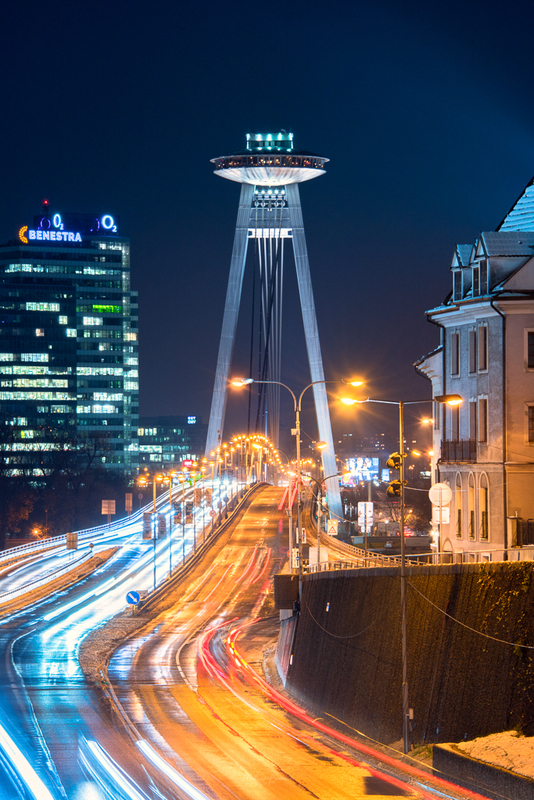 Enjoy a pleasant walk across the bridge from the old town, and take the lift up to the UFO observation deck for superb panoramic views over all of Bratislava from a height of 95 metres. On a clear day views can extend for 100 kilometres. The deck is open during daytime and night. There is a charge to get up here, but tripods are allowed and there is no time limit to your visit. Bratislava Card holders get a discount on the admission fee. After your visit to the observation deck you can continue to enjoy the view with food and drink in the restaurant one floor below. Take a zoom lens with you to home in on individual buildings, or stitch together multiple photographs to make a panorama of the city. 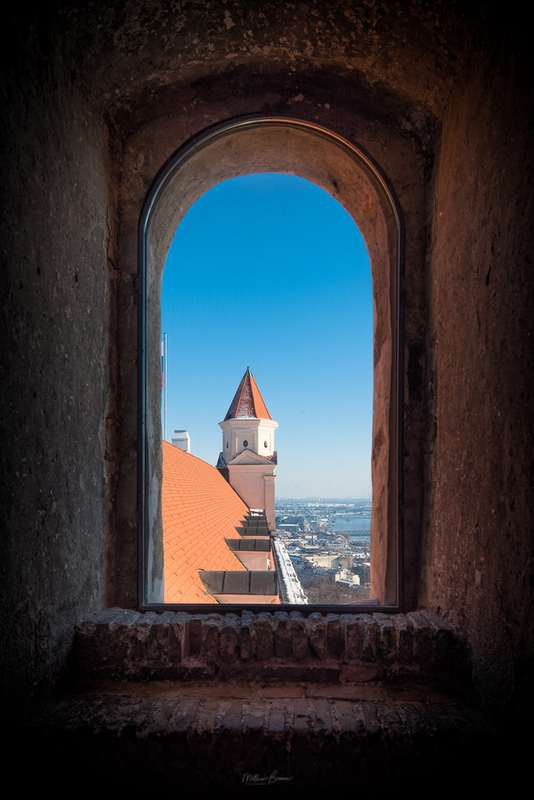 My favourite spot inside Bratislava Castle is the tower in the palace offering views across all of Bratislava city. Though it’s tempting to press your camera against the glass to take in the whole city, my tip is to take a step back and use the windows as a natural frame for your photographs. Tripods are not allowed here, so you will need to crank up your ISO setting and keep your shutter speeds quick. If your camera has a shutter priority (or “S”) mode, select a shutter speed of 1/100 and turn your ISO setting to “auto”. Your camera will then work out the rest. Some of the castle grounds can be accessed at all hours. 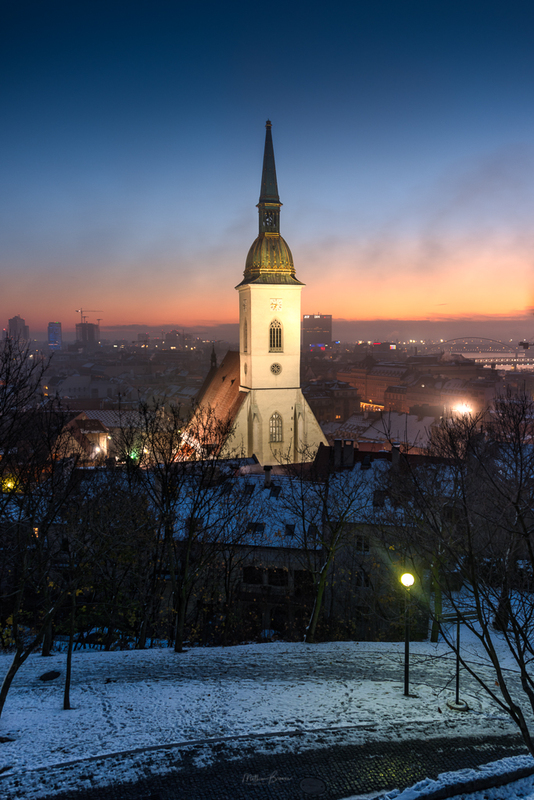 I visited at sunrise and captured St Martin’s Cathedral while it was still dark enough to be lit for night time – for me this is the best sunrise spot in all of Bratislava – you can watch the sun rise from the east and cast a warm glow on the city’s rooftops. There are also incredible sweeping views of the city and river. Cross the Danube via the Old Bridge to reach the neighbourhood of Petržalka. The Old Bridge is itself a photo opportunity while also giving views to the west of the Danube to the UFO Tower and Castle. 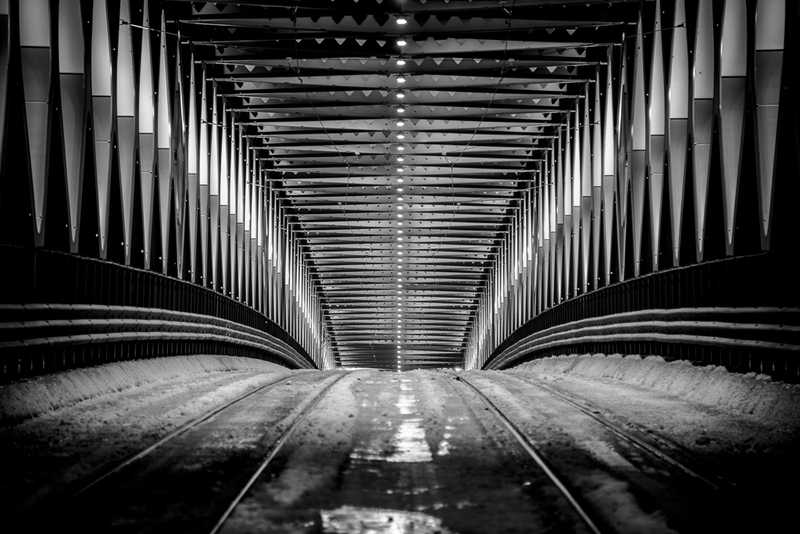 The interesting architecture of the bridge lends itself well to abstract photography. Try exploring the architectural details and symmetry with a zoom lens. A black and white photo will work well here regardless of the time of day or weather conditions. A riverside path takes you from the Old Bridge east towards the Apollo Bridge, which is lit up at night. However, these lights turn off before dawn, so early evening is best if you want to capture this bridge illuminated. 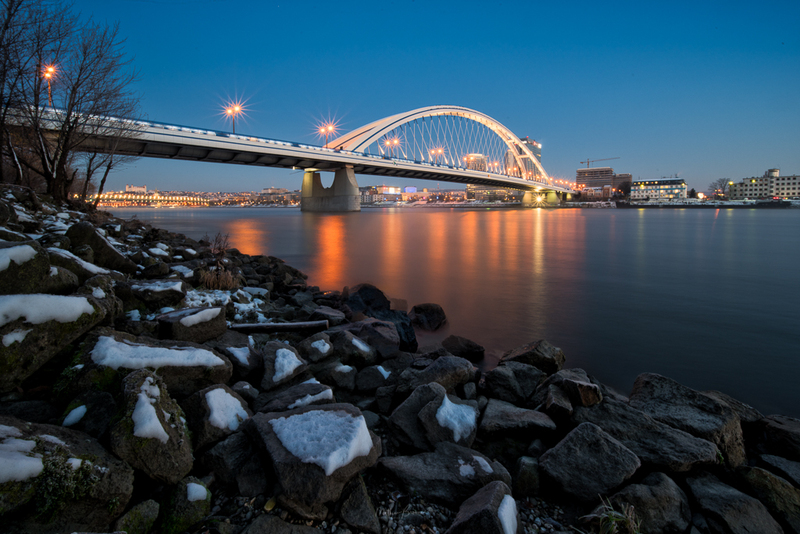 A normal or kit lens is sufficient to capture the bridge alone. A wide angle lens can also capture the rocks in the foreground. A high f-stop captures maximum depth of field and also forces a longer shutter speed which results in smoother water. An f-stop of f/8 or higher is recommended with a wide angle lens. There are a couple of opportunities here to practice your night photography techniques. The city’s trams pass under Bratislava Castle via a tunnel which can be found on Skalná street. This is the perfect place to capture a photograph of trams passing at night. 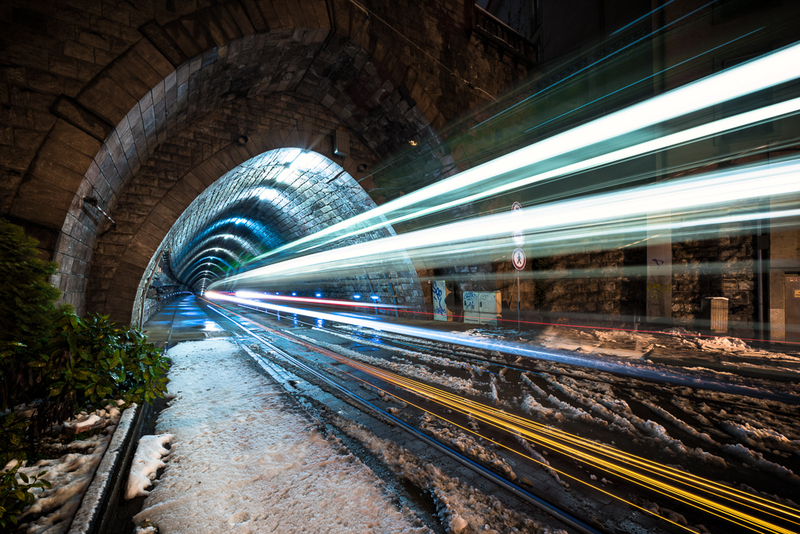 With a long exposure, these trams turn into streaks of light. There is a small footpath but of course, be very careful here for your own safety, and that of your equipment. Allow a tram or two to pass by so you know where it is safe to set up your tripod. To achieve this look you will need a tripod and a wide angle lens. Put your camera into manual mode, choose a high f-stop (f/8 or above is fine) and experiment with long shutter speeds. Just a few steps away is the bridge over the busy Staromestská road. This is a good place to take a long exposure at night to capture the cars streaking by, with the imposing UFO Tower behind it. To achieve this look, you will need a tripod and a zoom lens. 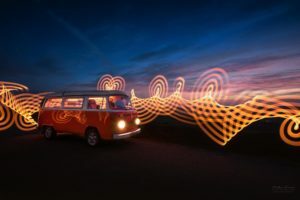 Put your camera into manual mode, choose a high f-stop (f/8 or above is fine) and experiment with long shutter speeds as cars pass by. This composition works particularly well as a portrait.